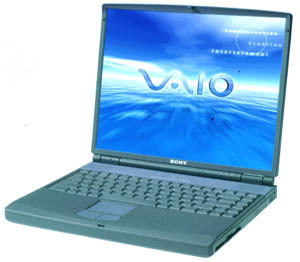 Weighing only 3.1 pounds (1.40 kg) and being only 0.9 inch (22.9 mm), the Sony Vaio PCG-505TR combines a 300 MHz Mobile Pentium MMX, 10.4 inch (26.4 cm) active matrix XGA display, 6.4 GB hard drive, 64 Mb SDRAM, double capacity Lithium-Ion battery, V.90 internal modem, iLink (IEEE-1394) interface, USB interface, PC card slot and touch pad with PEN operation in a magnesium alloy case. - WOW! 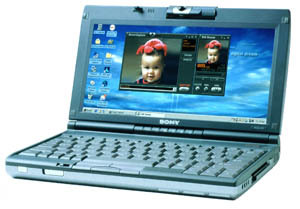 The Sony PCG-F290 is a high performance notebook that combines the mobile 400 MHz Pentium II processing technology with a 6.4 GB hard drive, 4X DVD-ROM drive, 64 Mb SDRAM, V.90 internal modem, removable 1.44 MB floppy drive, iLink port, digital touch pad, Lithium-Ion battery, built-in stereo speakers, microphone and a HUGE 15 inch (38.1 cm) XGA active matrix display. With the included Sony DVgate Motion / Still image capture and editing software, this unit becomes a seven pound digital video editing studio. - Impressive! 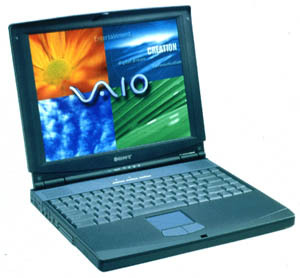 Using the latest 366 MHz Celeron processor, the Sony PCG-F250 combines a 13.1 inch HPA XGA display, V.90 internal modem, iLink port, built-in stereo speakers, microphone, digital touch pad, Lithium-Ion battery, 24X CD-ROM drive, removable 1.44 MB floppy drive, 32 Mb SDRAM and 4.3 GB hard drive into a seven pound notebook. 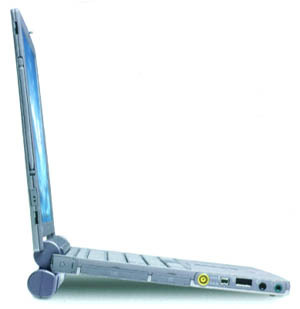 This 2.5 pound (1.13 kg), 1.5 inch (3.81 cm) thick micronotebook combines a fast computer (266 MHz Pentium MMX) with a digital camera (1/6 inch (4.23 mm) 270,000 pixel CCD) capable of taking both still pictures or 60 seconds of video. This 1024 x 480 resolution unit offers 64 MB of SDRAM, a 4.3 GB hard drive, Lithium-Ion battery, iLink port, VGA Video out, integrated V.90 modem.